How do you go about choosing a VBAC provider? Will they be tolerant or actually supportive of your choice(s)? What is the difference in providers and locations, and why does it even matter? A provider who is VBAC supportive will want you to have a safe outcome. They will work with you, in partnership, throughout your pregnancy in order to help facilitate a VBAC. They will work with you to stack the deck for a VBAC and encourage you to stay on track for a low risk birth. Most providers will understand that a multifaceted approach will be necessary to support a TOLAC (trail of labor after cesarean). This will include good nutrition, exercise, proper body mechanics, stress reduction, and sometimes the assistance of alternative care providers. Relatively flexible on the length of gestation as long as there are no other concerns. Open to induction or augmentation of labor if medically appropriate. Understanding that each labor and baby will have its own unique labor, and as long as the MotherBaby dyad are doing well, labor doesn’t need to have time limits. Encouraging laboring at home in early labor as long as it is safe. 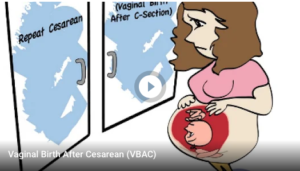 Have a low primary cesarean rate and a high VBAC rate. Supports both VBAC and VBA2C. Can promise that their whole team is equally supportive of VBAC, in case your preferred provider is not on call.